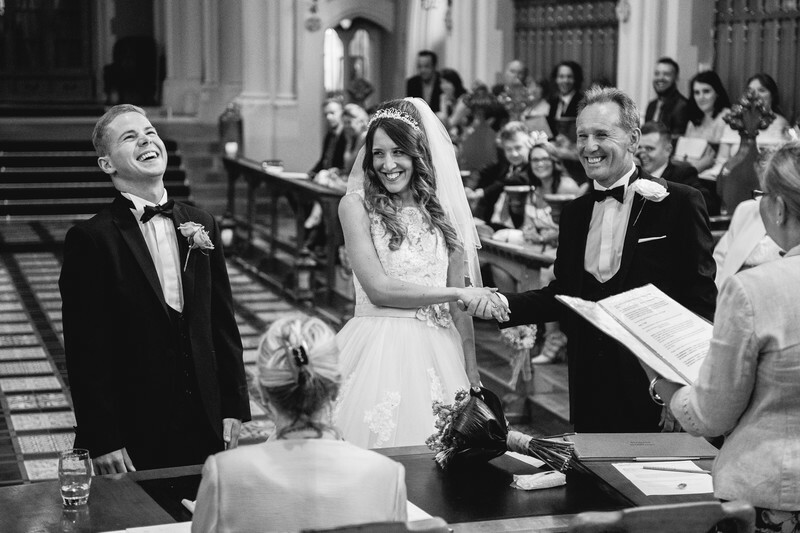 Rebecca and Ryan got married at Stanbrook Abbey Worcestershire. Both the bride and groom got ready at locations away from the venue before travelling there in time for the wedding. Whilst waiting for the arrival of the bride, Ryan showed just about every emotion possible. Below is a page from their wedding album, showing the full gamut of human emotion within the space of 5 minutes or so. Whilst waiting for Rebecca to make her way down the aisle with her father, Ryan initially started pacing up and down, back and fourth. For a short while he looked slightly ill and took to leaning on one of the old church pews that are inside the Callow Hall. He also spent some time leaning on the registrar's table, and at other times was being consoled by his best man. Ryan looked visibly nervous right up until the moment that Rebecca appeared into view. Once Rebecca and her father were at the front of the hall and stood alongside Ryan, he relaxed quickly. When the registrar came to the part of the service where she asked for the person who was giving Rebecca away, something was said that I didn't quite hear, but luckily I was poised and ready for Ryan's reaction, which can be seen in the main image for this article. Whatever was said, it was clearly hilarious!